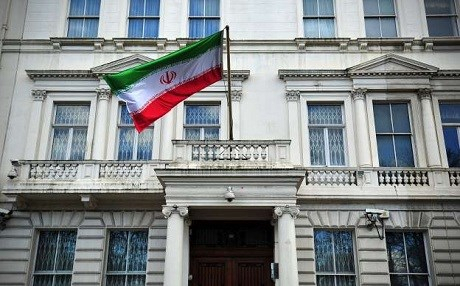 Police in The Hague arrested four people after objects were thrown at Iran's embassy late on Wednesday. Protestors threw beer bottles at the mission, the Dutch daily De Telegraaf has reported. The newspaper also published video of people climbing the embassy's walls before being detained by Dutch law enforcement. The demonstrators did not have a permit from the mayor and shouted "Iranian terrorist regime." They are reportedly planning another demonstration on Saturday. The protests come after the Dutch government accused Iran of hiring hit men to murder two people after the European Union sanctioned Tehran on Tuesday for allegedly plotting assassinations across the continent. The Dutch secret service "has strong indications that Iran was involved in the assassinations of two Dutch nationals of Iranian origin in Almere 2015 and in The Hague in 2017," Foreign Minister Stef Blok wrote in a letter to parliament released on Tuesday. Ali Motamed, 56, who was killed in Almere in 2015, and Ahmad Molla Nissi, 52, murdered in The Hague in 2017, were the victims. "These individuals were opponents of the Iranian regime," read the letter that was co-signed by Interior Minister Kajsa Ollongren. One of the arrested individuals was reportedly the son of Nissi, a leader in the Arab Struggle Movement for the Liberation of Ahwaz (ASMLA). Tehran lists the group as a terrorist organization. ASMLA is based in oil-rich Khuzestan and advocates for a separate Arab state from Iran. In June, the Netherlands kicked out two Iranian embassy employees for ties to the murders. Copenhagen has also argued for sanctions against Tehran, claiming Iran plotted to kill three Iranian dissidents on Danish soil. France also has frozen the assets of two suspected Iranian agents. They allegedly planned to bomb the National Council of Resistance or Iran (NCRI) near the capital in October.